Or this bathroom I renovated at our old house while the Mr. was traveling and I came down with pink eye and bronchitis?! And yet I persevered! I’m super excited to share a fun contest with you all today. I’m partnering with Lowe’s for a fantastic DIY opportunity called The UpSkill Project. Do you have a project around your house that you have been wanting to DIY but you aren’t totally sure how to tackle? Or maybe you are still saving up some extra cash to start. Well then this contest is for you! To enter all you need to do is submit a video of yourself detailing the skills you want to learn in order to update a space in your own home. Video entries must answer: (1) What the project is, (2) what skills you need to complete it, and (3) what having those skills would mean to you. You can click here to enter! Up to 5 submissions will get a $2,000 gift card to Lowe’s to use towards their project. Not only do you get the money you need to jumpstart your project, but Lowe’s will send along a team of experts who will work alongside you, teaching you the skills you need to complete your project. Think weekend warriors coming to your house to give you that kick-start you need while showing you the ropes. I say weekend warriors because they will help you complete your project in just two days! I really could have used the Lowe’s team a time or two at my house! I love that The UpSkill Project really focuses on empowering homeowners to help them gain confidence in their DIY skills. UpSkill teachers and Lowe’s associates will work side by side with you to help you get the job done. Bonus – I get to tag along during one of the projects here in Grand Rapids, which I will document to share here on the blog for all of my awesome readers. Sound great? Grab your camera, make a video and submit it here! The contest runs in the Grand Rapids area April 2 -16, so be sure to get those submissions in. Not local? Don’t worry, this contest will be coming to a number of other cities. Check The UpSkill Project’s website to see when it will be coming to your area. If you aren’t one of the lucky winners, Lowe’s will also be hosting a free workshop on July 21st at our local Lowe’s in Grand Rapids and yours truly will be there to learn right alongside with you. The skills they will be teaching range from painting, tiling, plumbing and learning how to use common household power tools. So, if you have always wanted to know the proper way to repair a hole in the wall, grout tile or use a wet saw, now is a great time to learn. Mark your calendar and come hang out with me! The workshop will run 10am – 1pm. Be sure to check out all the official rules here and good luck! NO PURCHASE NECESSARY. Homeowners and renters (with property owner’s permission) in eligible ZIPs only. Rules/Entry details can be found here. Ends 4/16/18. Ooooh! They need to come to Ohio! We just bought a house that needs some bathroom love! I have the perfect project to highlight their UpSkills! Fingers crossed they come soon! I hope they come your way, such a fun contest! Lowes is great! Question on your bathroom. Is that ceramic tile on the floor? What color is the grout? I think it’s ceramic yes, I don’t remember the grout color because this we laid that tile about 7 years ago now which seems crazy! I do know it was one of the lighter gray options from Lowe’s. So cool! I live in Grandville and have a bathroom straight out of the 60’s that we have been wanting to redo. Thanks for the inspiration – starting on my video now! This is the perfect opportunity – good luck! This is great! I have a laundry room that I’ve been wanting to update! There is a product at Lowe’s I’ve been thinking of for my walls!! I would love the help and some input on this project! Definitely enter, such a fun contest and I love that they will teach you the skills! Ohmigoodness- this is just what I need!!! I want to learn how to tile so badly!! Yes this is the perfect chance to learn!! Good tidings! Thanks for creating such a great chance for us. Definitely, want to participate in the contest. 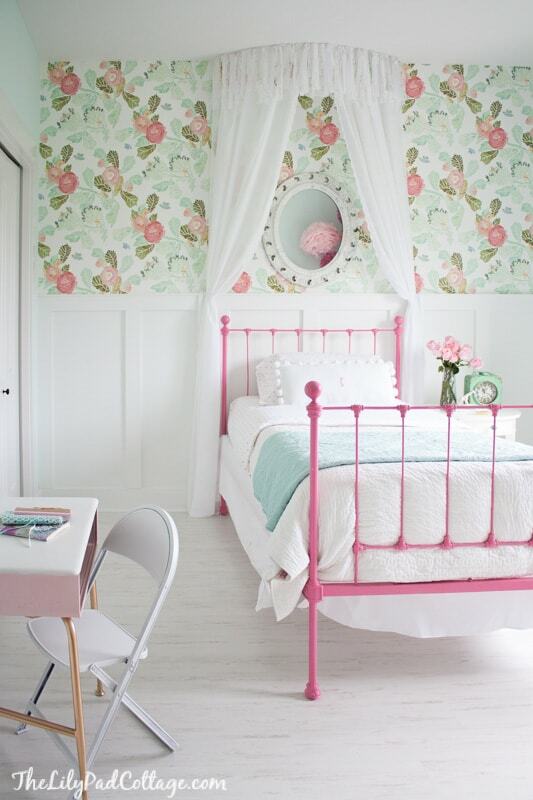 Your daughter’s room is so so beautiful. 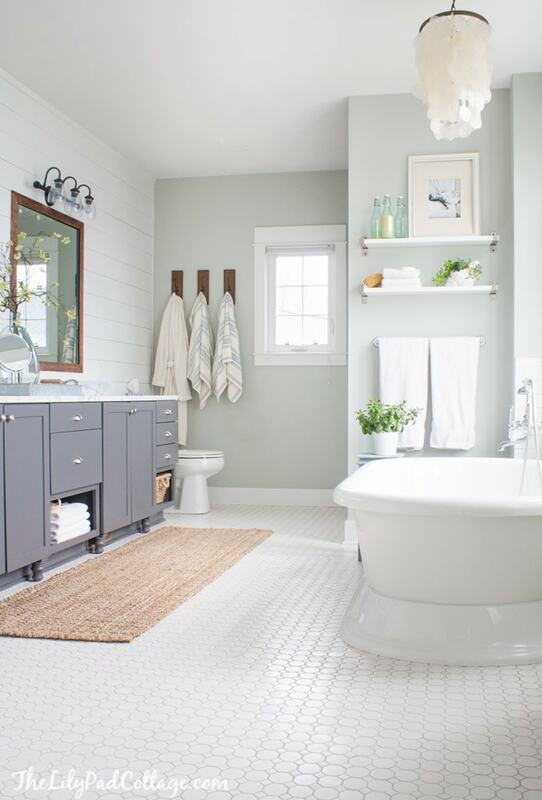 Your wall paint looks like a mint green or sea foam green. Trying to recreate a bathroom for my daughter. Love the color paint. Do you remember what type it is? P. S. The bathroom is beautiful and simple. Hey Dave sorry I don’t remember this one because it’s an old project from about 3 year ago now. Top Sail by Sherwin williams is a really pretty sea foam color I have used a lot. Can you tell me name / brand / finish of grey paint you used on bathroom cabinet? I unfortunately don’t remember this was a few years ago sorry!